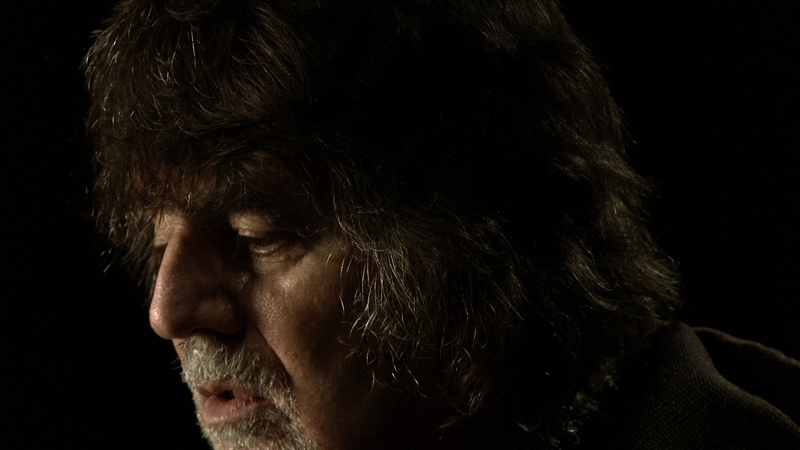 On Saturday, October 8, 2016 this 1:30 PM Flatland Film Festival screening of the Twilight Angel will be held in Louise Hopkins Underwood Center for the Arts’ Firehouse Theatre as part of the Saturdays at LHUCA art lectures followed by a Q & A with James Koskinas, Julie Schumer and John Witham. 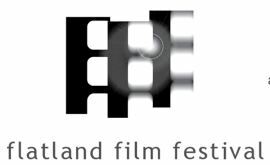 Founded in 2004, Flatland Film is a program of LHUCA that aims to cultivate an appreciation for film, video, and the digital moving-image expression and to support artists working in this mode of expression. For further information call 806-762-8606. The Twilight Angel is now available to buy or rent on VHX. We’ve also produced a special bonus program for the Deluxe Edition that features a behind-the-scenes story about development and production hosted by the film’s Producer, Julie Schumer, and the Cinematographer/Editor, John Witham. Click here to purchase or rent the Deluxe Edition now! 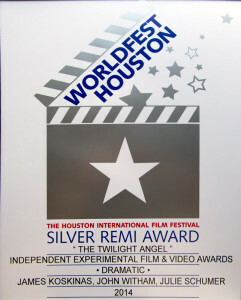 If you have been a fan and followed the development of the film, or even if you are new to this story you will enjoy this Twilight Angel Deluxe package which includes the final cut of the feature film and 33 minutes of bonus footage including interviews at the premiere, behind-the-scenes of development and production, music videos, experimental scenes, readings and more painting. Or, you can click here to rent or purchase the 55-minute feature only. The transactions are securely hosted by VHX, a direct-to-fan distribution platform built for premium video. They empower producers and publishers to sell our work from our own websites, directly to YOU our loyal fans. So we are keeping it in the family! We will have more news and content to offer soon. We hope you try it out and look forward to seeing your comments if you do. The Twilight Angel is going premiere at the coolest, hippest, most-meta venue for movies, music, art, readings, personal appearances and book-signings in Santa Fe, the Jean Cocteau Cinema. Thanks to your involvement and support, our award-winning handmade-in-New Mexico film is going to launch publicly in our hometown! And many of James Koskinas’ paintings from the movie will be hanging in the Jean Cocteau Art Gallery on November 14th and 15th. So, those of you who live near Santa Fe, plan to come to the beloved, historic Jean Cocteau Cinema, 418 Montezuma Avenue for ONE SHOW ONLY at 3PM, November 15, 2014. If you have seen the first-cut version at a private screening and offered us comments you will be delighted to see this new version at the premiere. Several of the scenes have been re-sequenced and the film now runs 55 minutes. Come see it on the big screen in the cozy atmosphere of the Jean Cocteau Cinema. We are also planning a fun after-screening reception at the Zia Diner, across the street from the Cocteau. To those dear loyal supporters who are outside of the Santa Fe area, we want you to know this is just the start. We are working on ways to get to you soon. We’ll be posting other dates and venues here soon. Or, come on out and visit beautiful Santa Fe for this kick-off in November! 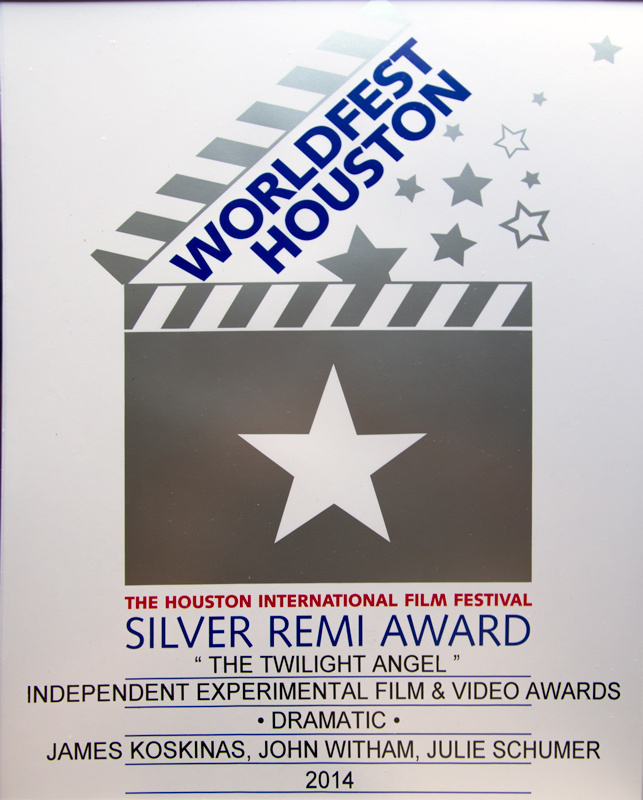 We are very pleased to announce the Twilight Angel won a Silver Remi Award at the WorldFest Houston film festival in April. Out of 4,400 entries this year only about 15% were rated high enough by the jurors to receive an award. Our film won the only Silver Remi in the highly-competitive Dramatic- Experimental category. 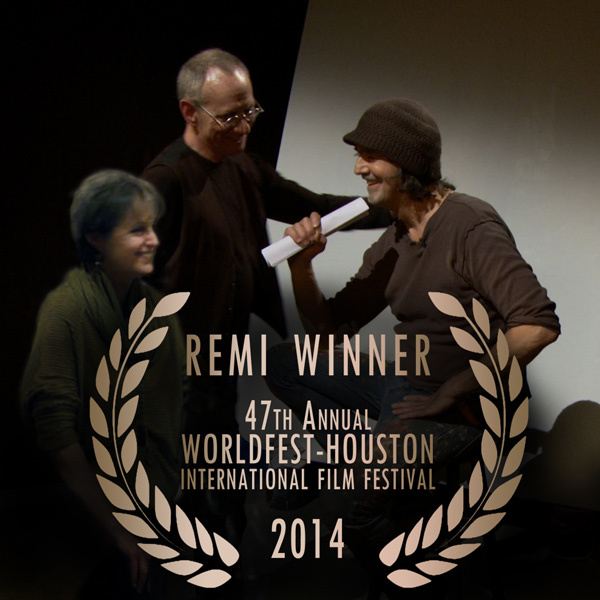 WorldFest-Houston is one of three original international film festivals in North America. It was founded in 1961 as Cinema Arts and is the only international film festival in North America to be dedicated completely to independent films. At a time when many festivals in the US seem to serve as unpaid publicity agents for major studios and distributors, WorldFest continues to provide a forum for the works of true independent filmmakers and a venue for their films. The Remi Award is inspired by the highly-regarded western artist Frederic Remington. We feel it is fitting that our film about an artist reclaiming his power has been awarded this particular honor. We appreciate the recognition by such a fiercely independent film festival and expect more and more people will get to enjoy our film soon as we begin the process of scheduling showings. Our community of fans and supporters have our constant gratitude for helping us make it this far. It is a success for all of us. We hope you are happy with what you have helped accomplish with the Twilight Angel. Now, stay tuned for what comes next! 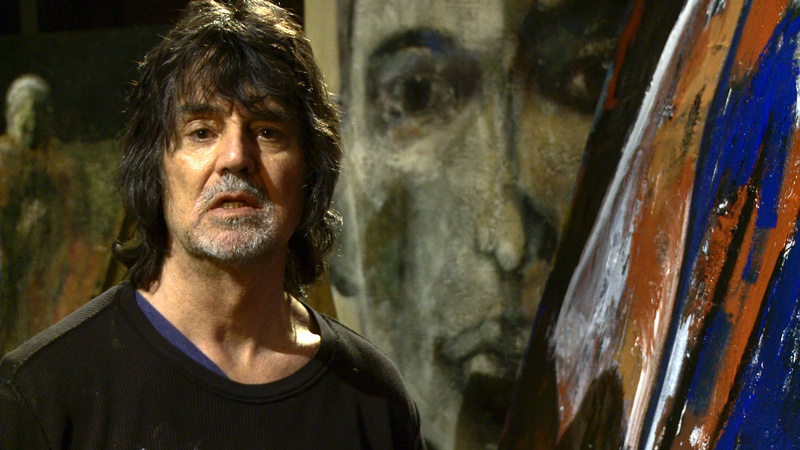 I felt intimately connected with the artist on his journey of self-discovery as I watched his struggle and artistic process in bringing his painting to life. I was captivated watching his brush strokes and color choices tell his story! High praises, laughter, tears and applause for your dear, raw, inspirational, daring journey put to film, James Koskinas, Julie Schumer, John Witham… I love that Fictional Character! I need to really see it a few more times to catalyze my full creative potential. Thanks for including us in your credits. You ALL amaze me. You truly do. I love who you each are and all the succulent gifts you bring to birth in this wild, awakening world. How do we change ourselves, to change the world…? I suggest the arts, truth, fierce self exploration & expression & by all means, see, own & share this movie, as it launches upon the world! & buy some art! That always helps me!